2x20W Amp click carries the MAX9744 stereo class D audio power amplifier from Maxim Integrated. This click brings the Class AB sound performance with Class D efficiency. The perfect combination for your speakers. 2x20W Amp click also offers 64 step volume control, single-supply operation, adjustable gain, and industry-leading click-and-pop suppression. Class-D amplifiers work by producing a series of square-shaped pulses of fixed amplitude, but varying duty cycle, representing the amplitude variations of the analog signal. The output of the modulator is used to gate the output transistors on and off, alternately. The high efficiency of a Class D amplifier is due to the switching operation of the output stage transistors. Since the transistors are either fully ON or fully OFF, they spend a small amount of time in the linear region and consume little amounts of power. In a Class D amplifier, the output transistors act as current steering switches and don't use a lot of additional power. A low-pass filter made of an inductor and a capacitor is used to produce a path for the low-frequencies of the audio signal (leaving the high-frequency pulses behind). When the output current exceeds the current limit, 5.5A (typ), the MAX9744 disables the outputs and initiates a 220µs startup sequence. The shutdown and startup sequence is repeated until the output fault is removed. When the die temperature exceeds the thermal-shutdown threshold, +165°C (typ), the MAX9744 outputs are disabled. Normal operation resumes when the die temperature decreases by a factor equal to the thermal-shutdown threshold minus the thermal-shutdown hysteresis, (typically below +150°C). 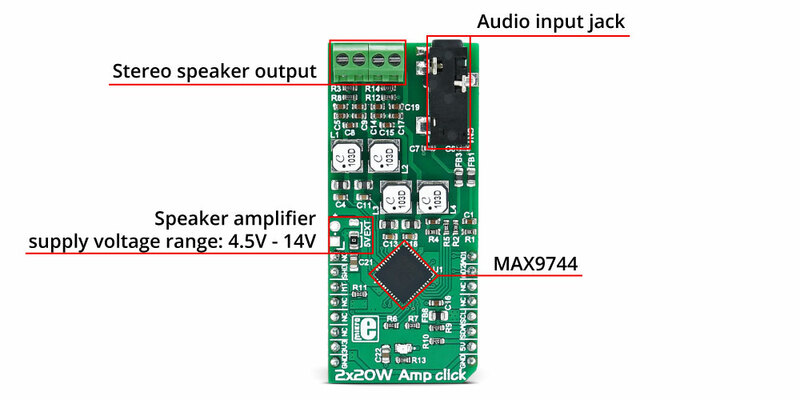 The board logic is powered from the 3.3V supply over the mikroBUS™ socket, while the amplifier circuit is powered by the onboard 5V power supply or an external source that can go from 4.5V to 14V. In order to use an external power source, the jumper JP1 must be positioned to the EXT position (see more in the Jumpers and Settings table). The MAX9744 features a shutdown mode that reduces power consumption and extends battery life. Driving SHDN pin low places the device in low-power shutdown mode. Connect SHDN pin to digital high for normal operation. For maximum flexibility, the click features volume control operation using an analogue voltage input or through the I2C interface. To set the device to analogue mode, connect ADDR1 and ADDR2 to GND. In analogue mode, SDA/VOL pin is an analogue input for volume control. The analog input range is ratiometric between 0.9 x VDD and 0.1 x VDD where 0.9 x VDD = full mute and 0.1 x VDD = full volume. Use ADDR1 and ADDR2 to select I2C mode. There are three addresses that can be chosen, allowing for multiple devices on a single bus. 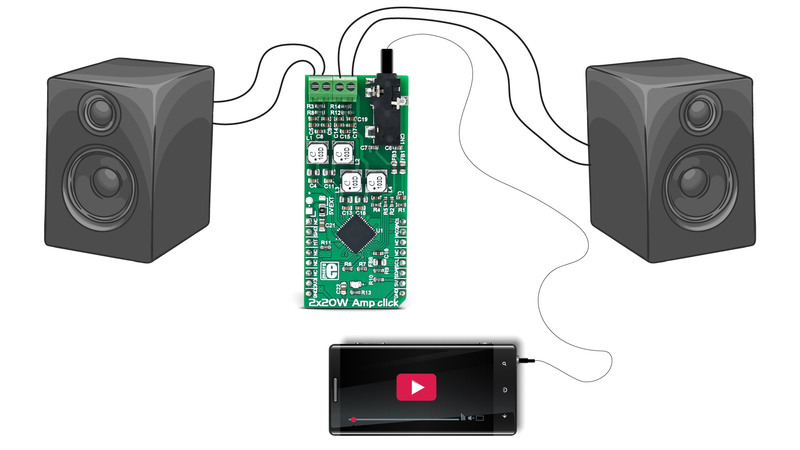 In the I2C mode, the volume is controlled by choosing the speaker volume control register in the command byte. There are 64 volume settings, where the lowest setting is full mute. Applications Battery-powered devices, mobile phones, portable sound systems, etc.